The Spitfire Mk IIb is a Rank II British fighter with a battle rating of 3.7 (AB) and 3.0 (RB/SB). This aircraft has been in the game since the start of the Open Beta Test prior to Update 1.29. 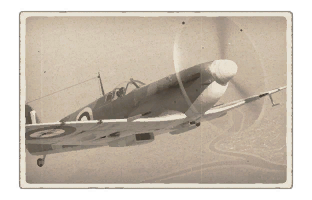 The Spitfire IIb is an excellent turn-fighter, and has excellent climb and speed characteristics - forming a middle ground between the sheer speed of the German fighters and American fighters and the nimble agility of the Japanese machines. These aircraft, however, have little in the way of armour protection - any hits will most likely damage something, and in addition, you will be helpless if you try to head-on something. Turn-fighting is the most efficient way of using this nimble, fast fighter, and it should be used in this way most of the time. A suggested loadout is to equip Tracers on the 7.7mm machine guns, and Stealth Belts on the 20mm cannons - this allows maximal amounts of damaging rounds - namely the Armour-Piercing Incendiary (AP-I), High-Explosive Fragmentation Semi-Armour-Piercing Incendiary (HEF-SAPI) and High-explosive Fragmentation Incendiary (HEF-I) Rounds. The technique to use this loadout will be described in the Usage In Battles Section. Note, however, that with the two 20mm cannons, the Spitfire Mk IIb can also be used as a reasonable Boom and Zoom fighter with less results. 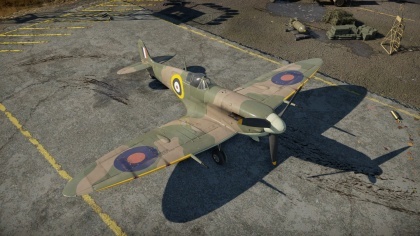 It is recommended to maximize the use of AP-I ammo for the Spitfire Mk IIb's 7.7mm machine guns and the HEF-I ammo for the 20mm cannons for air damage. It is also advisable to make sure that you conserve your ammo and only fire when you have a clear target, as you'll find you'll run out of ammo very quickly. Sixty rounds of 20mm is not a very large ammunition pool, and will run out faster than the machine guns in most cases. 38 mm Bulletproof glass in cockpit front. 6-7 mm Steel plate behind the pilot. Proximity of vital systems towards the front of the aircraft. This fighter, unlike American and German fighters, is neither a gun platform, nor a potent Boom-and-zoom fighter. It will not be able to hold its top speed for very long due to its lacking cooling systems unless the radiator is forced open by MEC - and even then, the extra WEP time provided isn't much. In addition, the aircraft is unable to deploy combat flaps, which means you cannot have 'reserve maneuverability' to out-turn a fighter in order to retreat. The similar muzzle velocities of the two weapons. The Hispano Mk. I only has 60 rounds of ammo, stored in drums. the 7.7mm guns have 350 rounds each. In continuous firing, assuming that no jams happen at all, the Hispano's ammo will dry up quicker than the 7.7mm Brownings. However, jams do happen and the Hispanos will jam quicker than the Brownings. A possible strategy is akin to that used on the Hurricane Mk IV, using the cannons sparingly. Use the cannons when in the aircraft's most effective convergence range and envelope, and use the machine guns to 'sight' the cannons. Fire the machine guns tracer belts for maximum AP-I and tracer ammo, using the similar muzzle velocities to get an idea of where the cannon rounds will go, and then firing cannons once you are getting consistent hits. Disclaimer: This is a very general guide to the aircraft's capabilities. Following these to the letter without consideration of the enemy's abilities can still lead to a loss. Japanese Fighters - Japanese fighters are more nimble than you. If you enter a turn-fight with them, and the pilot is smart, he or she can and will deploy their combat flaps and shoot you down. Attempt to bait them into energy-fighting maneuvers, where your superior speed, acceleration, and climb rate will prove you to be the victor. American Fighters - At this rank, you will be facing US fighters such as the F4F (the wildcats), the P-47 (the Thunderbolt), and many other aircraft which have 0.50-caliber machine guns. These large-caliber machine guns will shred a Spitfire to pieces if given the opportunity to fire a long, sustained burst at you, such as in a head-on engagement. Lure the enemy into a turn-fight, and use your maneuverability to break the enemy's aiming solution at the last moment with maneuvers such as the scissors and barrel rolls. German/Italian Fighters - German and Italian fighters will usually have cannons and hold a speed advantage over you, as well as being more capable at higher speeds and altitudes. If you head-on a German fighter, you will lose over 90% of the time, unless you are lucky and manage to land critical hits on the engine and the pilot - and this is also unlikely given that the 7.7mm machine guns are not known for their armour-piercing abilities. Like with American fighters, try to lure the enemy into a turn-fight, and use your maneuverability to break the enemy's aiming solution at the last moment with maneuvers such as scissors and barrel rolls. Russian Fighters - Russian fighters will have cannons, large-caliber machine guns, or both, in conjunction with small-caliber guns. Again, facing these head-on is suicide, and at the low altitudes you will meet them at, trying to use speed to out-zoom them is suicide. Turn-fighting may be optimal in these situations, but keep in mind that some Russian fighters are very, very maneuverable at low altitudes. French Fighters - French fighters are a bit of a mixed bag, having some of the more heavily armed aircraft and some of the less heavily armed aircraft in the game. In general, however, they will have either cannons or heavy-caliber machine guns, and maneuverability that is slightly better than American fighters. Turn-fighting these aircraft is preferable to a head-on engagement. BV 238 - Don't face these things from above, level, or from the rear. The massive amounts of defense armaments on this flying boat will ensure the Spitfire will be shot down. They're also massive - but not impossible to shoot down. The only reasonable chance of shooting the BV 238 down is via aiming for the cockpit at the front. The process s to do this is to get to its rear and dive down below the enemy, corkscrewing and rolling and skidding across the sky seemingly at random and get within 600 metres (0.6 km) of it, and approximately a hundred metres below. Start firing machine guns at the body, and try to get 'hit' notifications with it. Once closed into 400 metres, fire the cannons. Your priorities will be the weaponry upgrades and engine upgrades. It is suggested to research the gun upgrades first, and use engine upgrades to unlock tiers. Absolutely amazing turn capabilities, even at low speeds. One of the best turners. Relatively good armament with a 20 mm and 7.7 mm combination arrangement. Very easy aircraft to control. 7.7 mm machine guns have low damage and stopping power. Cannons have average ammo count for this rank. Hispano Mk.I 20 mm has a tendency to jam under continuous firing. Due to aformentioned weapon disadvantages, proper trigger discipline, convergence, and knowing the effective cone of fire is key. Wings overload easily at high speeds. Poor roll rate, especially at high speed. Only position for flaps is in landing mode. The Supermarine Spitfire was a British fighter which served with various nations from the late 1930s up into the 1950s. It was a single-engine, all-metal, low-wing monoplane with retractable landing gear. Various modifications served as fighters, interceptors, high-altitude fighters, fighter-bombers and reconnaissance aircraft. A total of some 20,300 Spitfires of all types were built during the war, including two-seater trainers. In the summer of 1939, an early Spitfire Mk I was fitted with the new Rolls Royce Merlin XII engine, which had a higher output of 1175 HP and was fitted with a Coffman engine starter instead of the previous Merlin’s electrical starter system. This, combined with the Rotol variable pitch propeller which had been used on many Spitfire Mk Is would now form the powerplant of the new Spitfire Mk II, although some production models used the De Havilland propeller. The Mk II was some 6-7 mph faster than the later Spitfire Mk I, but still slower than the original Spitfires before a series of modifications increased the aircraft’s weight. As with the Mk I, the Spitfire Mk II was produced with either eight machine guns as the Spitfire Mk IIA, or two 20mm cannon and four machine guns as the Mk IIb. The earlier problems with cannon fitted to the Mk IB had now been solved by introducing a belt feed system to the weapon to replace the earlier drum, turning the cannon on its side and fitting a blister on the wing to house the new mechanism. 920 Spitfire Mk IIs entered service; 750 Mk IIA and 170 MK IIB, although fighters used in the air-sea rescue role were later designated Mk IIC. The Spitfire II quickly replaced the Spitfire I, with the older variant being relegated to use in Operational Training Units. By April 1941, RAF Fighter Command had completed re-equipping with the Mk II, although this too would soon be replaced by the Mk V.
This page was last edited on 18 March 2019, at 16:25.